Home > About Us > Our People > Ludeen McCartney-Green, Esq. Ludeen is the Family Advocate Attorney for Green & Healthy Homes Initiative. 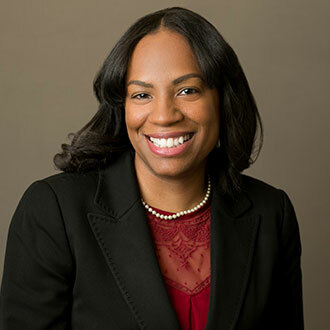 Ludeen brings her tremendous legal skills to represent families in courts throughout Maryland and to work in partnership with the Family Advocacy Services team to impact the lives of children in Maryland. She will also assist on Maryland, national policy, and legislative initiatives. Ludeen is passionate about furthering GHHI’s mission and being a stronghold advocate that “every child deserves a chance to live in a healthy, lead-free home.” Ludeen holds a Bachelor of Arts in Political Science-Prelaw from Michigan State University and a Juris Doctorate from Michigan State University College of Law. Ludeen has experience working for several law firms in private practice in Maryland, working for federal and state agencies in DC and Michigan, and as a Congressional intern. She is a member of the Maryland Bar Association (2013-Present).